Human communities and their physical environments do not exist in isolation. The behavior of fishers (e.g., effort spent fishing, the species targeted) cannot be separated from the abundance of fish. Likewise, the abundance of fish is significantly affected by how, when, and where fishers fish. The links between fisheries and armed conflict contain such feedbacks, depicted here as a coupled human and natural system. The human system on the left contains conflict, livelihoods, and food security. If unemployment increases and people cannot afford nutritious food like fish, food insecurity and the likelihood of conflict increase. During conflict, people may lose their homes and jobs. Food becomes more scarce and expensive, which increases how much effort people put into fishing. On the right of the diagram, the natural system contains fish and the small plants and animals that feed them. If top predators like tuna or sharks decline, the abundance of other fish and their prey will change in response. 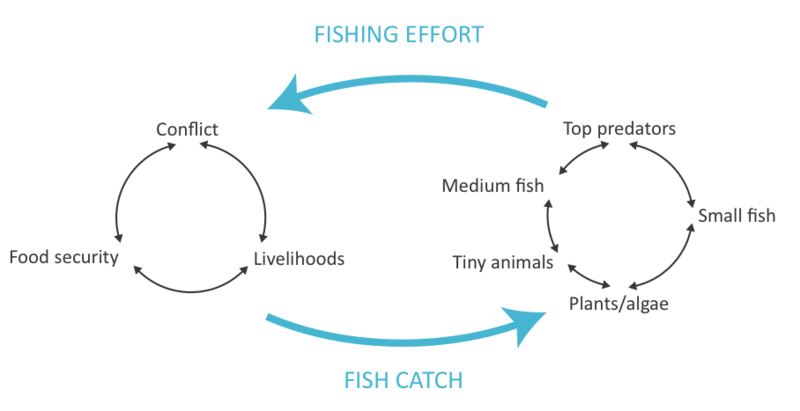 Complicated food webs and fishing pressure ultimately affect the abundance and therefore catch of fish. Good fish catch supports food and income, while poor catch reduces it, feeding back into the conditions that start or stop conflict. Ultimately, what does this mean? It’s complicated, yes, but whether fishing causes or prevents conflict is subject to a tangled web of factors and timing. Armed conflict can occur over fisheries themselves. The infamous 20th century Cod Wars between Iceland and the UK showed nations were willing to defend coveted fishing grounds with military force. In Lake Victoria, the Ugandan army has confronted Kenyan fishers over an island on their shared border. Off the coast of Somalia, disputes between foreign and domestic fishing vessels have been implicated in the rise of piracy and hostage taking. Such conflicts are about boats and fishers being in the same place at the same time. This reflects access rights to the fish, not necessarily concern over a decline in fish abundance. These conflicts are likely opportunistic, discrete occurrences that can be mitigated by territorial integrity (e.g., clearly delineated and enforced borders) by nations and comprehensive co-management in fishing villages. When overfishing or habitat damage cause fish populations to decline, the resulting conflict will be systemic and long-term. Fish stocks may crash suddenly and unpredictably, or their decline may be gradual and predictable. In the first case, the shock to livelihoods and food security will be quick. In the second case, fishers will expend more and more effort to catch fewer and fewer fish. Either way, conflict will occur directly over the shrinking state of the resource and indirectly as unemployment and food security worsen. Conflict over a declining resource base can be mitigated two ways: 1) sound conservation and management to preserve sustainability, and 2) livelihood diversification to provide alternative sources of income during fishing downturns. Fisheries provide food and livelihood security for many of the world’s poorest communities. Fish contains high-quality protein, omega-3 fatty acids, and essential micronutrients – calcium, iron, zinc – that support brain growth and nutrition. Over 56 million people were employed in the fishing sector in 2014, 20% of which were women. Income from fisheries, especially in the hands of women, translates to education for children. All of these factors ensure community stability and thus reduce the root causes of armed conflict. More directly, when men (and sometimes youth) are productively employed, they are less likely to join militia groups. Fisheries management also provides avenues for cooperation between nations that share fish stocks. The Lake Victoria Fisheries Organization unites the governments and the fishers of Uganda, Kenya, and Tanzania to manage shared fisheries resources. The model of co-management used around Lake Victoria has promoted cooperation, not competition, between fishers and fishing villages. And transboundary fishery collaboration is one productive way to reduce conflict over resources that cross national borders. Conflict can increase pressure on fisheries through movement of people or through rising food prices that encourage people to fish. When conflicts are far from fishing grounds, fisheries provide attractive employment opportunities for those fleeing fighting. Fishers in northern Sierra Leone fled their civil war into neighboring Guinea and resumed fishing, increasing the pressure on fisheries in Guinean waters. In Uganda, civil war in the north of the country was followed by an increase in the number of fishers around Lake Victoria. Additionally, during conflict there is greater likelihood of illegal, unregulated, and unreported (IUU) fishing, especially by foreign vessels. IUU fishing can rapidly and dramatically reduce fish stocks, especially when nations in conflict cannot enforce their maritime borders. Measuring the effect of conflict on fisheries is a tricky affair: data collection is disrupted during conflicts. It is difficult to draw a direct line between fighting and declines in fish abundance, especially given complicated food web dynamics. However, the effect of conflict on catch is observable, and my own research shows that fish catch declines 16% on average following the outbreak of civil conflict. Reduced catch translates directly to reduced incomes and food security in affected regions. Conflict can also relieve fishing pressure when it occurs near fishing grounds. During the World Wars, commercial fishing all but ended in the Northeast Atlantic because of the presence of hostile navies. Afterwards, fish stocks that had been in decline saw increases in fish size and catch. Indirectly, fishers may leave the fishing sector if they are recruited into guerrilla groups, as happened in Sri Lanka by the Liberation Tigers of Tamil Eelam. This is most likely to happen in places where rebel groups offer higher salaries than that earned from fishing. Naval blockades can also stifle fishing activity, as witnessed right now in Yemen, Somalia, and Somaliland. What is temporarily good for the fish is not usually temporarily good for people. The reduction in fishing can reduce food and job security. However, some research suggests fish catch quickly rebounds after conflict begins, so the negative effects on fishers might be short-term. But stalled fisheries ultimately will fuel the conditions that cause conflict or, at a minimum, exacerbate the negative effects of conflict on societies. The complicated links between fisheries and conflict means impacts can go either way: fisheries can make conflict worse or better, and conflict can make fisheries worse or better. The result depends on other conditions on the ground, timing, and location of the conflict. But the result is not pre-ordained. Governance mechanisms to promote sustainable fisheries, to create cooperative management mechanisms, and to support alternative livelihood programs are essential for preventing conflict and mitigating the impacts on fishing communities when conflicts erupt. 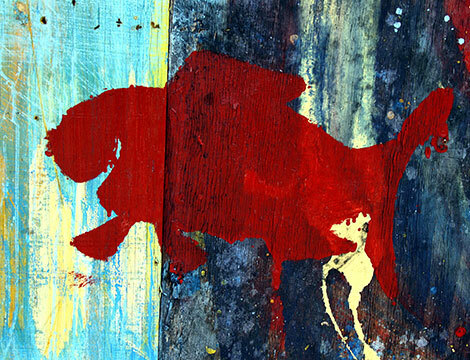 This piece was originally posted at Secure Fisheries (securefisheries.org). Sarah Glaser is a Senior Research Associate at Secure Fisheries, a program of One Earth Future. Her research addresses the role of fisheries in conflict, food security, and fisheries development in East Africa and Somalia.